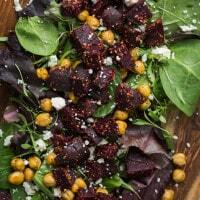 Crispy Chickpea and Za'atar Beet Salad | Naturally. Most of the time, the way I come up with recipes is more of a brain exercise than it is a time to sit down and sketch out a recipe. I take an ingredient and I challenge myself to come up with 10 different recipe ideas that featured this ingredient only using the ideas floating around in my head and the Flavor Bible to make sure I’m not mentally concocting crazy pairings. I do this every couple of weeks for 4 to 5 different ingredients which has led me to an arsenal of recipe ideas. It’s a great way to stretch my creativity and I’ve also found it helps helps to drastically increase the amount of unique recipes I make. (There are of course exceptions when I try something at a restaurant or see a killer recipe I want to try). I have some recipes that have been sitting in the cue for over a year, waiting their turn to be rounded out and tested. One of my earlier notes simply had written ‘za’atar + beets’. The slightly floral herby tint of the za’atar is one of my favorite ways to balance the earthiness to the beets. Later on, I tacked on ‘feta’ to this combination and for months, the recipe sat until just recently. As I enter in to the third trimester (!) of pregnancy, I’m pushing myself to eat well and to set good habits now (in hopes of keeping some semblance of healthy after the baby is born). And thus, I’ve been eating so many salads. Preheat oven to 400˚. Pat chickpeas completely dry on a clean towel and transfer to a baking sheet with edges. Drizzle with 1 tablespoon olive oil and sprinkle with salt and pepper. 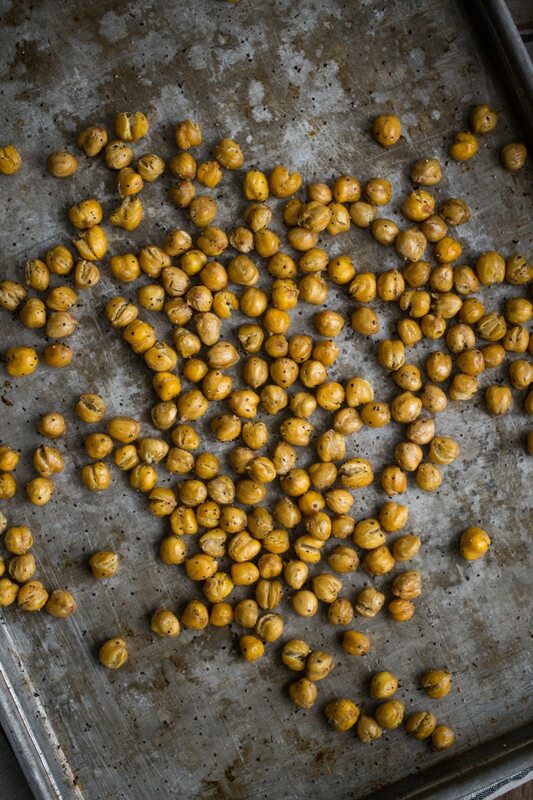 Shake pan until chickpeas are coated and roast for 45 minutes, until crisp. Remove, let cool, and continue to crisp while preparing the salad. Trim the ends from the beats and place in a small roasting pan. Drizzle with olive oil, cover with foil, and roast until beets are tender, 40 to 60 minutes (depending on size of beets). Let cool slightly then remove skin and cut into small pieces. Toss with 2 teaspoons of za’atar, adding more as desired. 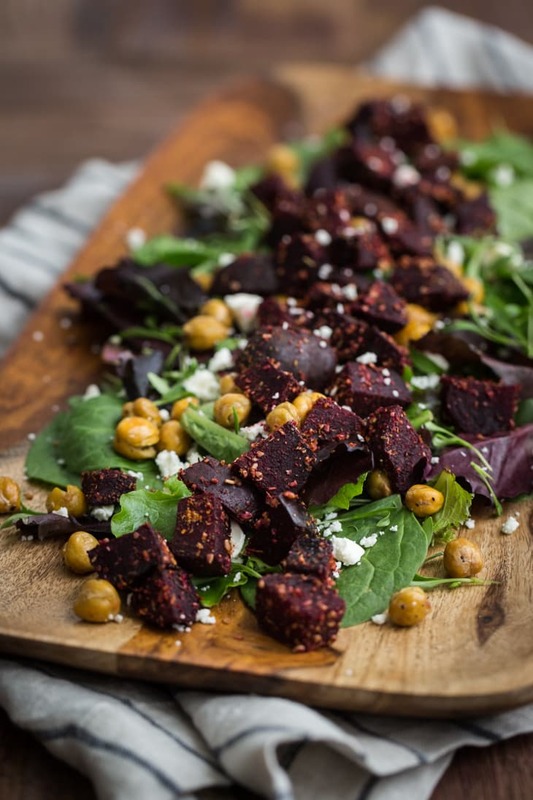 Assemble salad with lettuce, crispy chickpeas and feta- then layer beets on top and finish with a drizzle of lemon dressing. To make dressing, combine ingredients in a a jar with a tight lid and shake well. Use extras throughout the week. If looking to make your own Za’atar blend, Heidi has a wonderful recipe. Or you can purchase Za’atar- one of my favorites comes from Oaktown Spice Shop in Oakland. Crispy chickpea recipe adapted from Food & WIne. I have never heard of za’atar before. 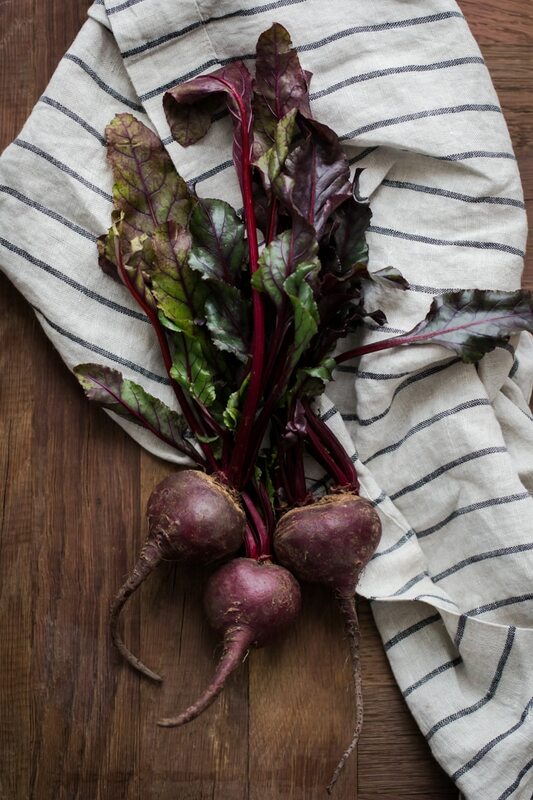 But I’m a huge fan of beets so this recipe is definitely making my mouth water! 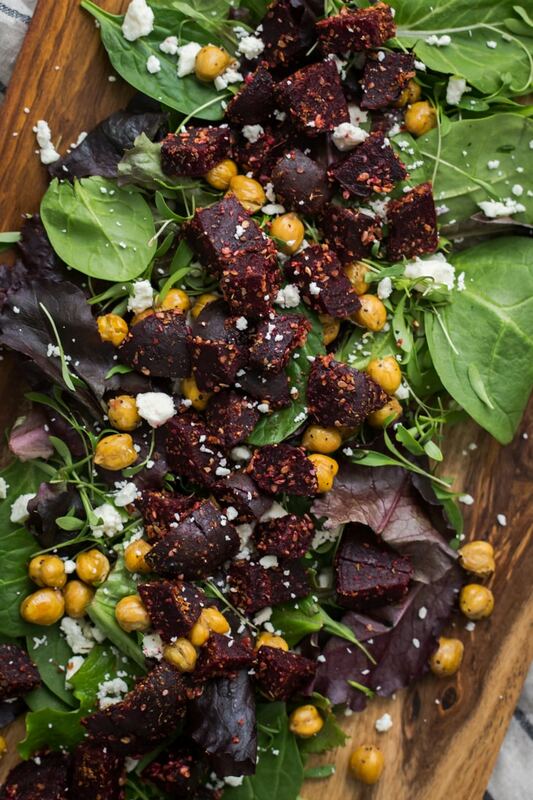 Looks amazing – love the textures and such a great use of za’atar Erin! I adore za’atar, almost as much as I love sumac. Such lovely flavour combinations. This looks delicious! It will be a big hit in my home. My husband’s family are Moroccan by way of Israel, so chickpeas, beets, and especially za’atar are staples in our home. If there isn’t homemade hummus in the fridge and hot za’atar pitas on the stove, something is wrong. Congrats on the baby. My little one is 3 months now. I try my best to eat healthy, and cooking at home and freezing food helps. It turns out breastfeeding makes me crave carbs in a way I never have so I’m always looking for nice salads as a balance. Can’t wait to try this one! This looks amazing! Just the type of inspiration I need for my vegan trial week! Looks so yummy! Thanks for the mention! This salad looks absolutely lovely! i adore your flavour pairings, but you also have a great knack for texture. This salad looks gorgeous 🙂 Welcome to the third trimester!! 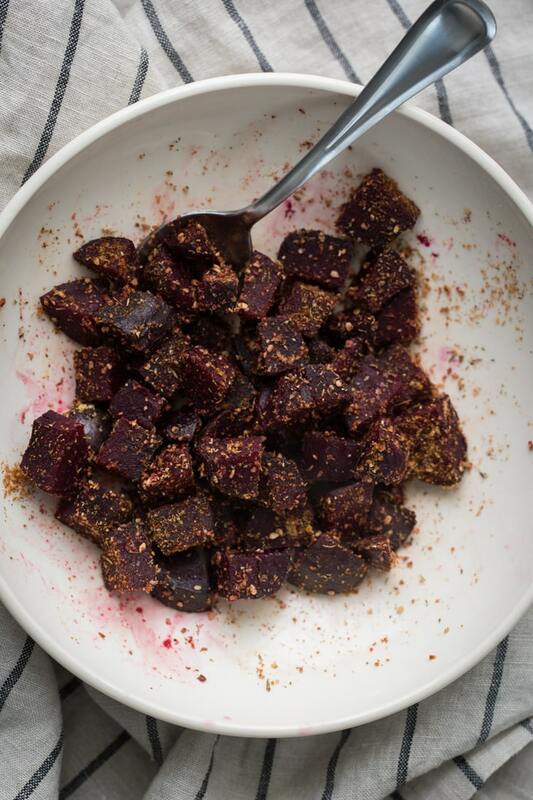 Such a fan of za’atar and roasted beets, so this is a match made in heaven for me! After 40 minutes my chickpeas were burnt to a crisp. Terrible. I’m sorry to hear that but I’ve made these numerous times at that temperature/time without fail. This looks delicious!! 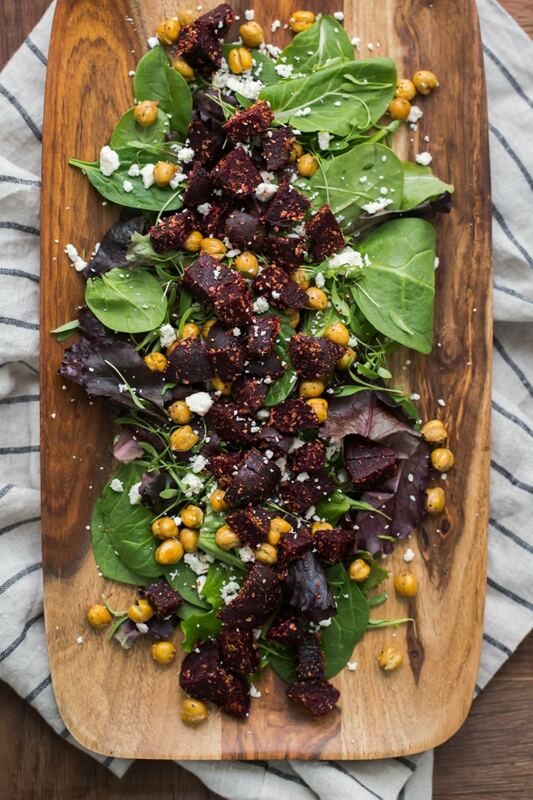 I have been wanting to try a za’atar recipe for quite a long time, and with this combination of chickpeas and beets, I think it would be awesome. Thanks for the inspiration!